Every year the Salvation Army performs at the Newtown Festival with its Band and Music Team, right outside its church doors on Constable Street. The Band is made up of 25 members and has performed on numerous tours both locally and overseas. 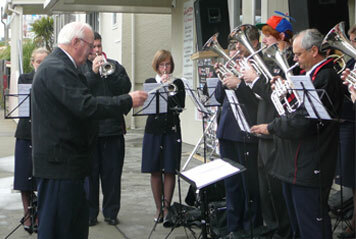 Their repertoire is a mixture of Salvation Army hymns and well known secular music. The Band loves to engage the crowd when performing and in recent years all ages have had a chance to conduct the Band. This is great fun for both the novice conductor and the crowd watching. The best time to catch the Band is late morning to mid-afternoon on Fair Day.